The Autobahn is the pinnacle of the German driving experience, perhaps the ultimate in driving altogether. Virtually all of the world's serious drivers have heard of it and longed to take their shot at conquering it. Teutonic cars are known for their precise engineering and craftsmanship; the Autobahn completes the driving equation. Some people are disappointed the first time they drive on the Autobahn. They come with visions of a twenty-lane superhighway where cars are barely a blur as they whiz by. In reality, the Autobahn looks like a typical freeway, and despite rumors to the contrary, not everyone is hurtling along at the speed of sound. The stories of speed anarchy are only half correct-- many sections of Autobahn do in fact have speed limits. What is widely regarded as the world's first motorway was built in Berlin between 1913 and 1921. The 19 km long AVUS ("Automobil-Verkehrs- und Übungsstraße") in southwestern Berlin was an experimental highway that was (and occasionally still is) used for racing. It featured two eight-meter lanes separated by a nine-meter wide median. Italy built several expressways (Autostrada) in the 1920s and Germany followed with its first "auto-only roads" opening in 1929 between Düsseldorf and Opladen and in 1932 between Cologne and Bonn. More routes were planned in the early '30s and Adolf Hitler, seeing the propaganda and expansionist benefits of a high-speed road system, started a program to build two north-south and east-west links. The first of these Reichsautobahnenopened on May 19th, 1935, between Frankfurt and Darmstadt. At the end of World War II, the Autobahn network totaled 2,128 km. Construction on new sections finally started again in 1953, with 144 km added between 1953 and 1958, bringing the total to 2,272 km. Starting in 1959, West Germany began Autobahn expansion in earnest by embarking on a series of four-year plans that expanded the Bundesautobahnen system to 3,076 km by 1964. Major additions continued during the next two decades, and the system reached 4,110 km in 1970, 5,258 km in 1973, 6,207 km in 1976, 7,029 km in 1979, and 8,080 km in 1984. A new series of five-year plans, with the goal of putting an Autobahn entrance within 10 km of any point in West Germany, had expanded the net to over 8,800 km by 1990. The reunification of Germany in 1990, however, put those plans on hold as the federal government focused on absorbing and upgrading the Autobahns it inherited from East Germany. The incorporation of those eastern Autobahns put the total Autobahn network at almost 11,000 km in 1992. Additions to the unified network increased the total to 11,515 km in 2000, 12,531 km in 2007, and 13,009 in 2018. Until 2000, the Autobahn was the world's second largest superhighway system after only the US Interstate System. Today, however, the Autobahn network has dropped to fifth place, having been eclipsed by China, Spain, and Canada. Early Autobahns were rather crude by today's standards. The first Autobahns, like their Italian counterparts, featured limited-access and grade-separated crossings, but no medians. The first Reichsautobahnen did have narrow medians but lacked shoulders, and ramps and waysides typically had cobblestone surfaces. 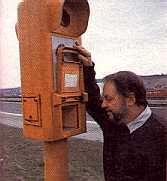 When Germany was reunified in 1989, the Autobahns of East Germany were in virtually the same condition as they were in 1945, exhibiting the aforementioned qualities as well as inadequate signing, infrequent (and often non-functional) emergency telephones frequently located in the center median, and service areas consisting of a dilapidated roadhouse next to a wayside. 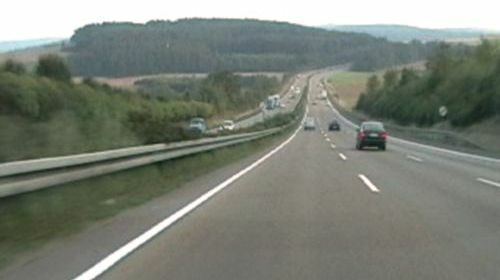 Newer West German Autobahns had for many years featured wide lanes, shoulders, landscaped medians with crash barriers, frequent roadside emergency telephones, and ample, well-provisioned service areas. After reunification, the German government expedited upgrading of the old East German Autobahns in a series of "German Unity Transport Projects." 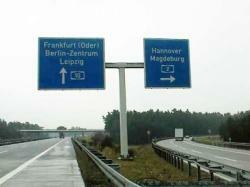 By the end of 2009, the program was nearly completed with about 2,100 km of upgraded or newly-built Autobahn. Two, three, or occasionally four lanes per direction. Lanes on rural sections are generally 3.75 meters wide except the left lane of newer three lane segments-- it's 3.5 meters wide. On urban sections, all lanes are 3.5 meters wide. A landscaped "green" median 3.5 or 4 meters wide (3 meters in urban areas). A double-sided guardrail runs down the middle. Glare screens are often used on curves. Some newer sections have concrete barriers instead of green medians. Outside emergency shoulders and long acceleration and deceleration lanes. Full grade-separation and access control, generally provided by half cloverleaf interchanges at exits and full cloverleafs or directional interchanges at Autobahn junctions. Interchanges are generally well-spaced, sometimes exceeding 30 km between. Grades of 4% or less. Climbing lanes are provided on most steep grades. Freeze-resistant concrete or bituminous surface. Roadbed and surface typically measuring about 75 cm (30 inches) in thickness. Reflector guide posts at 50 meter intervals. Frequent parking areas, often equipped with toilet facilities. Extensive and ample service areas featuring fuel stations, restaurants, and hotels. Automated traffic and weather monitoring and dynamic signs for displaying variable speed limits and/or advance warning of congestion, accidents, construction, and fog. Emergency telephones at 2 km intervals. Pre-signed detour routes to facilitate emergency closures. Wildlife protection fencing, crossover tunnels and "green bridges". Maintenance is superb. Crews inspect every square meter of the system periodically using vehicles with high-tech road scanning equipment. When a fissure or other defect is found, the entire road section is often replaced. Signs, barriers, and other features are also well-maintained. Generally-speaking, the mainline Autobahn routes avoid the metropolitan cores. Instead, spur routes provide Autobahn access into and within the cities. These spurs are usually built as "urban Autobahns" (Stadtautobahn). Design features of urban Autobahns include six or eight lane elevated or depressed roadways with frequent and more closely-spaced diamond interchanges. The standard rural signage standards are suspended in favor of more closely-spaced signage. There are sometimes no emergency phones or roadside reflector posts. Tunnels, overpasses, and sound barriers are more frequent and nighttime illumination is often provided. 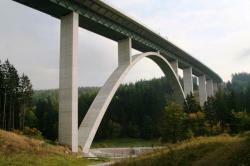 To help maintain safe grades, the Autobahn system has extensive tunnels, bridges, and viaducts. Some viaducts (Talbrücke) are often over 500 meters high and sometimes more than a kilometer long. 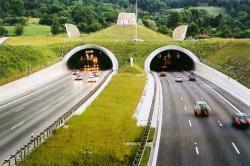 The Autobahn system now has over 70 tunnels, both through mountains as well as in urban areas. As a result of recent tunnel disasters elsewhere in Europe, extra emphasis has been placed on tunnel safety. All Autobahn tunnels have extensive safety systems including 24-hour monitoring, motorist information radio and signs, frequent refuge rooms with emergency telephones and firefighting equipment, emergency lighting and exits, and smoke ventilation systems. Bicycles, mopeds, and pedestrians are specifically prohibited from using the Autobahn, as are any other vehicles with a maximum speed rating of less than 60 km/h (36 mph). Passing on the right is strictly prohibited! Slower vehicles must move to the right to allow faster traffic to pass, and drivers should stay in the right lane except to pass. When passing, you must do so as quickly as possible, and it's in your best interest to do so lest you become a hood ornament on that Porsche that was just a speck in your mirror a second ago and now is close enough for you to see the look of disdain on the driver's face. You are, however, allowed to pass on the right in heavy traffic when vehicles have started queuing, but only at a low speed. You may also pass on the right while you are still in the designated acceleration lane upon entering the Autobahn. Entering and exiting is permitted only at marked interchanges. Traffic entering the Autobahn must yield to traffic already on the Autobahn. 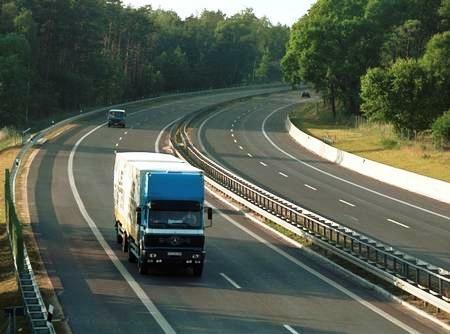 On Autobahn sections with three travel lanes, trucks over 3.5 tonnes and any vehicle with a trailer are prohibited from using the far left lane. During traffic jams, motorists in the left lane are required to move as far to the left as possible and those in the adjacent center or right lane must move as far to the right in their lane as possible, thus creating a gap (Rettungsgasse) between the lanes for emergency vehicles to pass through. If you have a breakdown or accident, you must move to the shoulder if possible and place a warning triangle 200 meters behind the scene. You must report the incident to the authorities using the nearest emergency phone (see below). 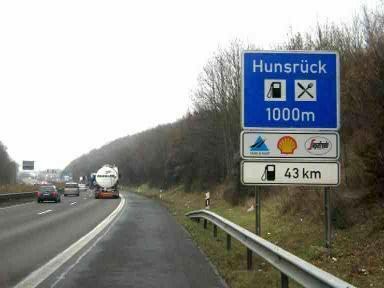 It is illegal to run out of fuel on the Autobahn. Technically, there is no law specifically against this, but it is illegal to stop unnecessarily on the Autobahn and this law is also applied to people who run out of fuel as such an occurrence is deemed to be preventable. 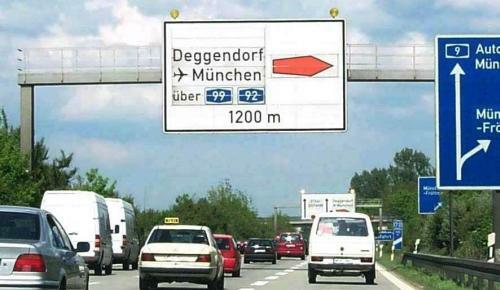 There are no tolls for passenger vehicles to use the Autobahn. However, trucks must pay a per-kilometer fee which is collected electronically. Many drivers flash their high beams ("Lichthupe", or "light honking") or switch on their left turn signal to politely (or not) request that you vacate the left lane to let them pass. There are conflicting opinions about whether this is legal or not and why, but there are reports that drivers have been cited for doing this. So while there is no specific law regarding this, it appears that such actions can be construed to violate Germany's coercion laws, so do so at your own risk. Despite the widespread belief of complete freedom from speed limits (and a lobbying effort that has the same influence and deep pockets as the American gun lobby), some speed regulations can be found on the Autobahns. Many sections do indeed have permanent or dynamic speed limits ranging from 80 to 130 km/h (50-80 mph), particularly those with dangerous curves, in urban areas, near major interchanges, or areas where there are specific safety concerns. In construction zones, the limit may be as low as 60 km/h (37 mph). Also, some sections now feature nighttime and wet-weather speed restrictions, and trucks are always regulated (see table below). That said, about two-thirds of the Autobahn network has no permanent speed limit, although there is always an advisory limit of 130 km/h (81 mph). This recommendation is generally seen for what it is-- an attempt by the government to cover itself without having to upset millions of Porsche and BMW owners/voters. However, if you exceed the advisory limit and are involved in an accident, you could be held responsible for some of the damages even if you are not at fault. Vehicles that are limited to a lower speed limit will usually have a decal resembling a speed limit sign displayed on the back of a vehicle indicating the speed it is authorized to travel depending on its specific characteristics. In some cases, those vehicles may be authorized to travel slower or faster than the general limit and will display the appropriate decal indicating such. Over 3,200 km of Autobahn now feature dynamic speed limits which are adjusted to respond to traffic, weather, and road conditions. 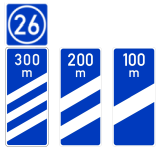 These speed limits and conditions are indicated using a rather elaborate system of electronic signs (see Traffic management section below). Various efforts over the years to enact a national speed limit have not made great strides. Studies have attributed the high speeds on the Autobahn to air pollution that has caused widespread Waldsterben, or forest destruction. 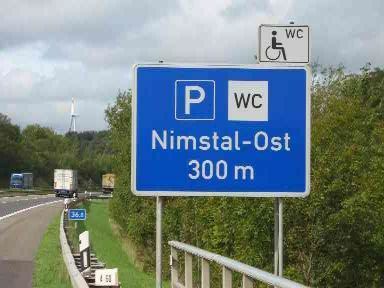 As a result, some Autobahns in forest areas have seen new limits imposed, but a national limit remains unlikely, as demonstrated during the coalition government negotiations in 1998. In those talks between the then-new Federal Chancellor Gerhard Schroeder's Social Democrat party and the Greens, one of the final points to be resolved was the Greens' desire for a nationwide 100 km/h speed limit on the Autobahns. In the end, a compromise was struck whereby energy taxes would be raised and local governments could reduce speed limits on city streets, but no national Autobahn speed limit would be implemented. Subsequent discussions by various groups of a possible blanket limit have met with immediate and formidable political resistance, most recently in early 2019. A proposal then to implement a 120 km/h speed limit to help Germany meet its 2020 climate goals died almost immediately. Indeed, pollls have consistently shown that about half of Germans oppose Autobahn speed limits, a wide enough margin to render any attempt at implementation an act of political suicide. "Freie Fahrt für freie Bürger! ", or "Freedom of driving for free citizens! ", remains the rallying cry. A national speed limit of 100 km/h (60 mph) was enacted in November 1973 during the energy crisis. It was repealed less than four months later. In 2008, the federal city-state of Bremen enacted a 120 km/h speed limit on all Autobahns in that state, the first and thus far only federal state to do so. However, in practice, this only added speed limits to 6 km of Autobahn as the remainder of the 60 km of Autobahn in that state already had speed limits in place. Despite the prevailing high speeds, the accident, injury and death rates on the Autobahn are remarkably low. The Autobahn carries about a third of all Germany's traffic, but injury accidents on the Autobahn account for only 6% of such accidents nationwide and less than 11% of all traffic fatalities were the result of Autobahn crashes (2014). In fact, the annual fatality rate (1.6 per billion km in 2014) is consistently lower than that of most other major superhighway systems, including the US Interstates (3.4 in 2013). Because of Germany's robust economy and location in central Europe, traffic on the Autobahn is generally quite heavy. In 2008, motorists logged a staggering 225.3 billion kilometers on the Autobahn, averaging almost 50,000 vehicles per day on any given segment. 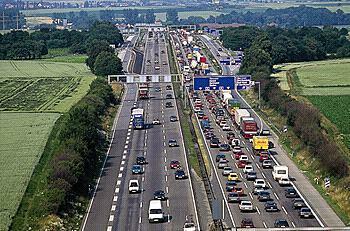 As a result, traffic jams (Stau) occur frequently on the Autobahn, especially on Fridays, Sundays, holidays, and anytime after an accident or during bad weather or road work. Regional traffic reports, with a variety of monikers including Verkehrsmeldungen, Verkehrsdienst, Verkehrsfunk, and Stauschau, are excellent and are provided on most radio stations. Germany is divided into several traffic reporting regions (Verkehrsrundfunkbereich). There used to be "traffic information radio" signs along the Autobahn to indicate the local radio stations carrying the traffic reports for the local area, but now this has been rendered obsolete as radios now have automated traffic report tuning via the Traffic Program (TP) function. You will need to have a working knowledge of German to understand the radio reports, though. 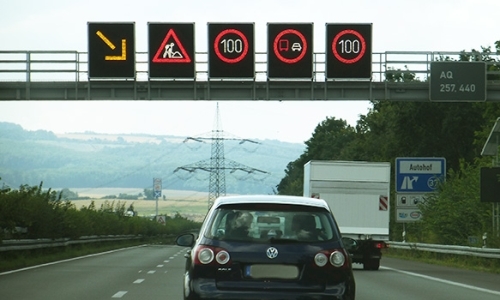 In addition to radio traffic reports, many sections of Autobahn are equipped with traffic monitoring systems and dynamic signs (see Traffic management section below) to warn of downstream incidents or congestion, provide a controlled reduction in the speed of traffic as it approaches the jam, and suggest alternate routes. 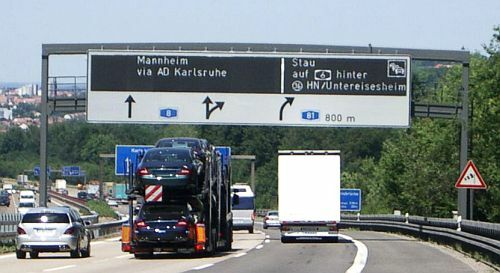 On sections without digital signs, the Autobahn police (Autobahnpolizei) generally do an excellent job of warning of congestion via portable roadside signs, signs mounted on police cars parked along the shoulder, or on banners draped from overpasses. Traffic information is also available from several other resources including the websites of radio and TV stations, auto clubs, government agencies, online maps, and increasingly through on-board telematics systems using the Traffic Message Channel (TMC) service. A couple of notes about traffic reports: sometimes the "traffic report" may include information that has nothing to do with traffic such as civil emergency alerts, police bulletins, etc. Also, if you have a German rental car with a CD or MP3 player, don't be surprised if your tunes are interrupted by reports of a Stau somewhere-- German radio tuners continue to monitor the last-selected radio station even when an auxiliary input is selected. Radio stations broadcast a special tone at the start of traffic reports which causes the tuner to switch the audio from the auxiliary input to the radio so that you can hear the information. Traffic reports use one of several terms to describe varying levels of congestion: "Stau" usually means a colossal traffic jam where you'll have the opportunity to get to know the people in the cars around you, "stockender Verkehr" indicates the only slightly more tolerable stacking or slow-and-go type traffic, while "dichter Verkehr" or "zähfliesender Verkehr" denotes the annoying but hardly-noteworthy heavy or sluggish but moving traffic. Autobahn maintenance and improvements don't escape the German penchant for obsessiveness. As a result, construction zones (Baustelle) are frequent and widespread. The standard protocol for large projects is a traffic shift-- the lanes for both directions are narrowed and crammed onto one side of the Autobahn so that the other side can be worked on in its entirety. Such situations are well-marked with "lane crossover" signs and speed limits are usually reduced greatly in these areas. In the event that a segment of Autobahn must be closed due to an accident or other emergency, pre-posted provisional detours are ready to guide traffic around the closure. As you exit, look for the U-numbered "provisional detour" sign on the exit ramp-- this denotes the detour route for that exit. Follow the same-numbered route over the secondary roads and you'll eventually arrive at the next downstream entrance ramp. If that entrance is also closed, just follow the next sequential detour number to reach the next entrance after that. However, there is one small gotcha-- odd numbers continue in one direction, even numbers in the opposite direction. So if you're following an odd numbered route, be sure to follow the next sequential odd number (and, obviously the same goes for even-numbered routes.) These routes also come in quite handy if your patience runs-out and you want to get around a Stau. The Autobahn has an extensive system of service areas (Rasthof, Raststätte) generally spaced between 30 and 60 kilometers apart. These usually feature a fuel station (Tankstelle), restaurant or snack bar, convenience store, telephones, and restrooms. Many also feature hotels, showers, playgrounds, conference rooms, and chapels. There are over 700 service areas in operation and they're open 24 hours a day. A brochure with maps and charts showing the network of service areas and the facilities available at each can be obtained at any service area and is also available on the web (see links below). Smaller parking areas, many equipped with restrooms (WC), are even more abundant along the Autobahn. These are marked with signs like the one below. The past few decades has seen the proliferation of service facilities (mainly fuel stations and fast-food restaurants) just off Autobahn exit ramps. Especially increasing in popularity are truck stops or travel centers (Autohof) which offer facilities comparable to the service areas, but usually at considerably lower prices. 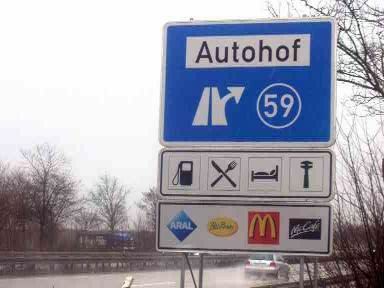 These are typically marked by special signs on the Autobahn like the one below. 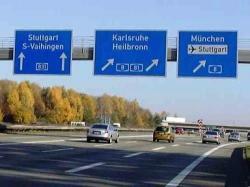 Signage on the Autobahn is excellent. 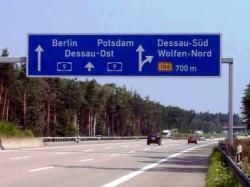 All direction signs on the Autobahn as well as those giving directions to the Autobahn are white on blue. Signage before interchanges is standardized both in form and placement. Overhead signs are being used increasingly more frequently. These signs generally take on the forms shown in the various pictures below. Note that the route number shields are typically located at the bottom of the signs rather than at the top like in the US. Drivers should also be aware that unlike the US, directions on the Autobahn (as well as other roads) are not given using the cardinal directions (North, South, East, West), but rather by destination cities. Know what the major cities are along your route before you start out. A helpful idiosyncrasy is the tendency to list major cities on signs on connecting Autobahns that lead toward another Autobahn route that will actually take you to that city. The most important cities start appearing on signs hundreds of kilometers away. One other peculiarity is that when several cities are listed, the farthest city is generally listed first or on top; in the US, it's usually the opposite. The last place listed is usually the name of the next exit. Finally, you may come across names that include a one or two letter abbreviation (e.g. "S-Degerloch" or "HH-Zentrum"); these correspond to the official license plate registration city abbreviations and indicate an exit for a district or other destination in that city. So "S-Degerloch" would be the exit for "Stuttgart-Degerloch" while "HH-Zentrum" denotes "Hamburg-Zentrum", or downtown Hamburg. Solid white line: Marks the left edge of the road or, on the right side, marks the inside of the shoulder or the right edge of the road if there is no shoulder. Also used sometimes between traffic lanes to indicate that changing lanes is not allowed. Long, thin broken white lines: Separate traffic lanes. Short, thick broken white lines: Separate a deceleration (exit) lane or acceleration (entrance) lane from the main traffic lanes. V-diagonal markings: Mark the restricted area at an exit gore. Yellow markings: Used in construction zones and supersede all regular white markings. 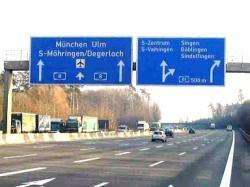 See the Signs and Signals page for complete information on German road signs and markings. During the past few of decades, German traffic engineers have developed extensive and sophisticated traffic management systems to manage the increasingly congested traffic along many Autobahns and expressways. These systems consist of surveillance cameras, speed sensors, and a variety of variable message signs, as well as equipment to detect and automatically warn of adverse weather including fog, rain, and ice, all connected by communications systems to centralized traffic monitoring and control centers located throughout the country. There are two main objectives of these systems: to warn and provide systematic regulation of traffic approaching or driving through areas with congestion, construction, or hazardous weather conditions, and to divert traffic around incidents and congestion. Studies have shown that these systems have reduced accidents by as much as 30% within three years of being installed. The first such systems were developed and tested in the mid '70s and since have been expanded to over 2,500 km of Autobahn especially near interchanges, in areas subject to frequent congestion or dangerous weather conditions, as well as in and approaching tunnels and metropolitan areas. These systems have also been installed on several non-Autobahn expressways, and the transport ministry is prioritizing their expansion. Now in widespread use are dynamic traffic flow control systems that allow for variable regulation of traffic in response to congestion, road work, or weather conditions. Common examples include the temporary implementation or reduction of speed limits, passing restrictions, or lane closures. The intent of these systems is to gradually and systematically reduce the speed of traffic approaching incidents or congestion. Many of these systems are completely automatic and adapt based on prevailing traffic and/or weather conditions. The signage used in these systems typically consists of an overhead gantry with a digital display over each lane and displays between lanes that can display facsimiles of official traffic signs to warn of downstream conditions and implement dynamic regulations. The signs can also indicate lane closures using the standard international lane control symbols. Below are examples of these electronic signs. In addition to indicating lanes blocked by accidents or construction, lane control signals are used in some areas to close lanes to help reduce congestion or conflicts at interchanges. For instance, if there is significantly heavier traffic merging from Autobahn 1 onto Autobahn 2, the right lane on Autobahn 2 may be closed to provide an unobstructed lane for the heavier traffic to merge into. When reduced speed limits are displayed, it is important to comply and you will find that the limits shown are generally very appropriate for the prevailing traffic or weather conditions. It should be noted that the speed limits and other regulations shown are enforceable and many areas are also equipped with photo radar that is integrated with the system (and thus is aware of the current speed limit.) 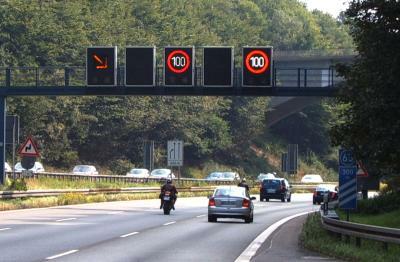 When different speed limits are shown on a single gantry, the limit shown applies to the lane under the sign. In the example below, the speed limit in the left lane would be 120 km/h, 100 km/h in the center lane, and 80 km/h in the right lane. Over 1,700 km of Autobahn are part of dynamic alternate route guidance systems. These systems employ changeable guide signs which, when activated, display recommended alternate route guidance to help drivers avoid incidents or congestion. Some areas employ "substitutive routing" where the destinations shown on the standard blue guide signs are changed using mechanical panels to re-route traffic onto different routes. In other areas, "additive routing" is utilized. In this case, the regular blue guide signs are static, but additional white signs with changeable panels and the big orange "alternate route" arrow symbol are used. The arrow points in the recommended direction to follow along with the destination city, route number, and/or vehicle types (e.g. trucks) that the suggested alternate route applies to. For instance, in the picture below, traffic headed to Deggendorf and the Munich airport is being advised to exit in 1200 meters and follow the A99 and A92. Once you are on one of these alternate routes, continue to follow alternate route arrow signs until you have reached your destination or have returned to the original route. Note that many times much of the alternate route is marked by permanent static signs, but a dynamic sign is used at the initial "decision point". In recent years, a new type of dynamic route guidance signage has seen widespread deployment. The "dynamic route guidance with integrated traffic information" signs, typically located on the approaches to interchanges, are a hybrid static and variable sign. The static signage shows the lane arrows and route numbers of the upcoming interchange. The embedded digital panels, when activated, can show both incident or congestion warnings and corresponding recommended alternate routes. The placement of the dynamic information on the sign corresponds to the static lane assignments to help facilitate quick comprehension and decision-making by drivers. 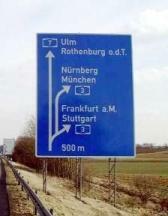 An example of this signage is below and shows the recommended alternate route to Mannheim via Karlsruhe junction by continuing straight ahead instead of exiting onto A81 as there is a traffic jam on the A6 past the (36) HN/Untereisesheim exit. These signs are also often used to provide ephemeral route guidance to stadiums and special events. 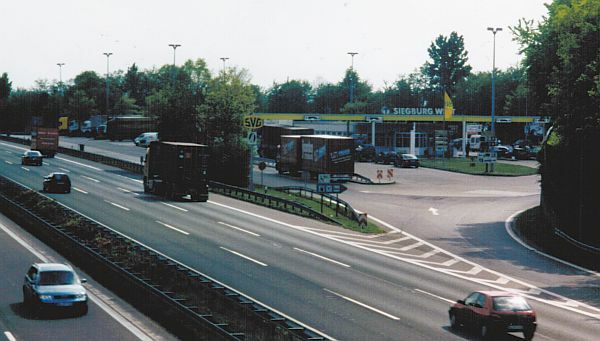 In 1976, a ramp metering (Zuflussregelung) pilot project was undertaken on the A3 in the Bonn area. However, this project was discontinued due to numerous technical reasons. 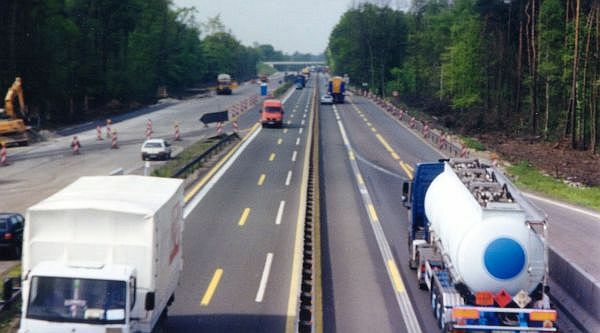 In 1998 and 1999, several pilot projects were launched to again test ramp metering, this time at three locations on the A94 in Munich, at five locations on the A40 between Gelsenkirchen and Bochum, and at one location on the A1 near Dortmund. Those experiments were successful and today there are about 100 locations throughout Germany with entrance ramp meters, mostly concentrated in the Rhein-Ruhr area, with 30 more locations planned. Like their counterparts in the US and other countries, ramp meters work by limiting the number of vehicles entering the Autobahn using a traffic signal on the entrance ramp. This helps reduce congestion on the Autobahn by spacing-out entering traffic, thus eliminating the shockwave caused by the sudden inflow of a large number of vehicles. Studies show metering increases the capacity of the through lanes by up to 5% and increases the speeds on those lanes by 10-30 km/h, thus shortening travel times. They also have been shown to reduce entry-related crashes. Ramp meters use the standard red-yellow-green traffic signals although the cycle is much faster. A sign posted on the signal will indicate how many vehicles are allowed to enter on each green signal (e.g. "1 Fahrzeug bei Grün".) The signals are typically dark when traffic is free-flowing and activated when traffic density builds. They can operate on a regular-interval cycle, variable-interval cycle based on local traffic conditions, or in coordination with the regional traffic management system. Along some sections of Autobahn with heavy traffic volumes, traffic may be permitted to temporarily use the outside emergency shoulder as a traffic lane during congested periods. Lane control signals and/or "shoulder open to traffic" signs indicate when this is permissible. Traffic managers will first determine that the shoulder is clear of breakdowns and debris before allowing traffic onto the shoulder. There is typically a 100 km/h speed limit implemented when the shoulder is in use. Hard shoulder running is usually considered as an interim solution until the affected roadway can be widened. In the event of an accident, breakdown, or other emergency along the Autobahn, you are never more than a kilometer away from help. Nearly 17,000 emergency telephones (Notrufsäule) are located at 2 km intervals along the sides of the road. The direction to the nearest phone is indicated by a small arrow atop the roadside reflector posts. In long tunnels, emergency phones are located in refuge rooms every 100-200 meters. The emergency phone system was privatized in 1999. Prior to that, call went to the nearest Autobahn district office. Now, all calls go to a central call center in Hamburg. In the event of an accident, dispatchers there will immediately connect the caller to the nearest police or emergency services office. For breakdowns, the dispatcher will obtain the information necessary to send the appropriate service. This may include the "Yellow Angels" of the ADAC or AvD auto club, a tow truck, or an insurance, dealership, or rental car repair service. Roadside assistance is free, but you'll likely have to pay for parts. If you need to be towed, there is no charge to tow the vehicle off the Autobahn at the next exit, but you will have to pay for towing beyond that. If you're driving a rental car, all services should be covered by the rental agency. Depending on the time of day, volume of calls, and traffic conditions, response time for a breakdown may vary from a few minutes to possibly over an hour. There are now two varieties of emergency phones in use. On the older phones, you will find a cover with a handle. Lift the cover all the way and wait for a dispatcher to answer. The newer phones don't have a cover; instead, they have an external speaker/microphone area with two buttons that you can press to connect you to the appropriate dispatcher. There is a yellow button with a wrench symbol for reporting a breakdown and a red button with a red cross to report an accident. Press the appropriate button and wait for a reply. In most cases, the location of the phone is transmitted automatically when your call is connected. If not, you will need to give the dispatcher the kilometer location of the phone as indicated on a label on the inside of the cover or near the speaker and your direction of travel. For an accident, report the number of vehicles involved and any injuries. For a breakdown, be prepared to report the vehicle's license number, make and model, color, and your auto club, insurance company, or rental agency. An English-speaking dispatcher is usually available. After calling, return to your vehicle or the accident scene and wait for help. For breakdowns, someone will arrive shortly to assist you. In the event of an accident, a cavalry of emergency aid will descend on you. Police, fire service, ambulances, and emergency doctors all respond to Autobahn crashes. A medical evacuation helicopter is also always on standby. Alternatively, you can contact the emergency call center via mobile phone at 0800 6683 663. Despite the proliferation of mobile phones, the Autobahn emergency phone system still handles about 200 calls a day. Authorities still recommend using the emergency phones since your location can be determined exactly.